When you started playing the Little Alchemy game, it was easy to create new elements. Just choose an element, then drag another element to it, boom a new element gets created. As you progressed, some combinations refused to create new elements. You continued playing the game and at a point it appears like there is no other combination that will yield a new element. Sorry dear, I really know how you feel right now. The little Alchemy game is not a game just anyone can play without any assistance. If you really want to complete the game, there are two things you can do. One, you can program a computer to try every possible combinations in the game, then tell you those combinations that yielded new elements. Two, you can reach out to other little alchemy players and ask them about combinations that have worked for them, Alchemy game guide. The first option is the best way out, but to do that you’ll have to be a programmer. Not just a programmer, you will have to be a good programmer. Are you a good programmer? I guess not. In short, the first option is quite infeasible. What about the second option? Let us take a look at it, ‘you can reach out to other little alchemy players and ask them about combinations that have worked for them, Alchemy game guide’. Oh, this really sounds possible. Interestingly, you have just implemented the second option. 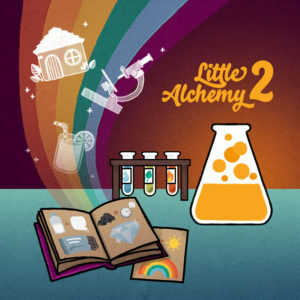 You have just implemented the second option by reading this article; Little Alchemy cheats ‘. This article will provide over a hundred combinations that yielded new elements. So, get ready to try any new combination you find in this article. Wait a minute please. Before we delve into the combinations, I quickly want to explain something about the presentation of our combinations. We will select an element, then all other elements that it can be combined with as well as their resulting element will be listed. Ready? Let’s go there. AIR: +Air = Pressure; +Cloud = Sky; +Dinosaur = Pterodactyl; +Earth = Dust; +Egg = Bird; +Energy = Wind; +Fire = Energy; +Lava = Stone; +Life = Bird; +Metal = Rust; +Pressure = Atmosphere & Wind; +Steam = Cloud; +Steel = Rust; +Stone = Sand; +Water = Rain; +Wave = Sound; +Soap = Soap Bubble; +Wine = Vinegar. WATER: +Air = Rain; +Airplane = Seaplane; +Bird = Duck; +Carbon Dioxide = Soda; +Chicken = Chicken Soup; +Cloud = Rain; +Cold = Ice; +Desert = Oasis; +Earth = Mud; +Egg = Hard Roe; +Energy = Steam; +Fire = Steam; +Flour = Dough; +Fruit = Lemonade + Juice; +Garden = Pond; +Glass = Aquarium; +Glasses = Swim Goggles; +Grass = Dew; +Gun = Water Gun; +Horse = Hippo; +Lava = Obsidian; +Leaf = Tea; +Life = Plankton; +Mountain = River; +Pencil = Paint;; +Pipe = Water Pipe; +Plant = Algae; +Pond = Lake; +Rainbow = Paint; +Sand = Beach; +Sea = Ocean; +Statue = Fountain; +Steam Engine = Steamboat; +Unicorn = Narwhal; +Water = Sea; +Wood = Boat; +Flower = Perfume; +Rose = Perfume; +Soap = Soap Bubble; +Wheel = Waterwheel. FIRE: +Air = Energy; +Bird = Phoenix; +Bread = Toast; +Carbon Dioxide = Fire Extinguisher; +Clay = Pottery & Brick; +Dough = Bread; +Dust = Gunpowder; +Earth = Lava; +Egg = Omelette; +Gun = Flamethrower; +Gunpowder = Explosion; +Human = Fireman; +Ice = Water; +Jedi = Darth Vader; +Lizard = Dragon; +Mountain = Volcano; +Mud = Brick; +Ocean = Salt; +Pig = Bacon; +Plant = Tobacco; +Pumpkin = Jack-O’-Lantern; +Sand = Glass; +Sandwich = Toast; +Sea = Salt; +Sky = Sun; +Stone = Metal; +Sugar = Caramel; +Tree = Charcoal; +Vegetable = Pumpkin; +Water = Steam; +Wax = Candle; +Wood = Charcoal & Campfire & Smoke; +Oil = Oil Lamp. EARTH: +Air = Dust; +Bird = Ostrich; +Cloud = Fog; +Coffin = Grave; +Corpse = Grave; +Dinosaur = Fossil; +Earth = Pressure; +Earthquake = Mountain; +Energy = Earthquake; +Fire = Lava; +Lava = Volcano; +Life = Human; +Paper = Map; +Plant = Grass; +Rain = Plant; +Sky = Horizon; +Space = Planet; +Steam = Geyser; +Tool = Field; +Water = Mud; +Wave = Earthquake. LIFE: +Air = Bird; +Armor = Robot; +Clay = Golem; +Corpse = Zombie; +Double Rainbow = Unicorn; +Dough = Gingerbread Man; +Earth = Human; +Farmer = Livestock; +Forest = Wild Animal; +Metal = Robot +Ocean = Plankton; +Rainbow = Unicorn; +Sea = Plankton; +Sky = Bird; +Space = Alien; +Steel = Robot; +Stone = Egg; +Swamp = Bacteria; +Water = Plankton; +Wood = Pinocchio. OCEAN: Airplane = Seaplane; +Antarctica = Iceberg; +Bird = Seagull; +Blood = Shark; +Earthquake = Tsunami; +Egg = Hard Roe; +Fire = Salt; +Horse = Seahorse; +Ice = Iceberg; +Life = Plankton; +Light = Lighthouse; +Moon = Tide; +Plant = Algae + Seaweed; +Sickness = Seasickness; +Sky = Horizon +Star = Starfish; +Sun = Salt; +Unicorn = Narwhal; +Volcano = Isle; +Wild Animal = Shark; +Wind = Wave. WIND: +Beach = Dune; +Boat = Sailboat; +Desert = Dune; +Energy = Hurricane; +House = Windmill; +Ocean = Wave; +Paper = Kite; +Sand = Dune; +Sea = Wave; +Snow = Blizzard; +Squirrel = Flying Squirrel; +Stone = Sand; +Tree = Leaf; +Wheel = Windmill; +Wind Turbine = Electricity; +Wood = Flute. PAPER: +Airplane = Paper Airplane; +Baker = Recipe; +Bird = Origami; +Blade = Confetti; +Computer = Printer; +Cookie = Fortune Cookie; +Earth = Map; +Flour = Recipe; +Gift = Wrapping Paper; +Gold = Money; +Music = Sheet Music; +Paper = Newspaper; +Pencil = Letter; +Sand = Sandpaper; +Scissors = Confetti; +Sky = Kite; +Story = Book; +Tobacco = Cigarette; +Wind = Kite; +Wood = Book; +Enginner = Blueprint. WOOD: +Beaver = Dam; +Bird = Woodpecker; +Blade = Axe; +Charcoal = Pencil; +Cheese = Mousetrap; +Coal = Pencil; +Corpse = Coffin; +Fire = Charcoal + Campfire + Smoke; +Fish = Fishing Rod; +Hay = Broom; +Horse = Trojan Horse; +House = Log Cabin; +Human = House; +Leather = Drum; +Life = Pinocchio; +Metal = Hammer; +Paper = Book +Pencil = Ruler; +Pressure = Paper; +River = Bridge; +Snow = Snowboard; +Tobacco = Pipe; +Tool = Wheel; +Wall = Fence; +Water = Boat; +Wheel = Cart; +Wild Animal = Beaver; +Wind = Flute; +Wizard = Wand; +Fabric = Tent. HUMAN: +Airplane = Pilot; +Alcohol = Drunk; +Armor = Knight; +Axe = Lumberjack; +Bacteria = Sickness; +Bat = Batman; +Beer = Drunk; +Bicycle = Cyclist; +Bird = Angel; +Blade = Blood; +Blood = Vampire; +Boat = Sailor; +Bread = Baker; +Brick = House; +Broom = Witch; +Campfire = Story; +Castle = Monarch; +Chainsaw = Lumberjack; +Christmas Tree = Santa; +Clock = Watch; +Cow = Milk + Minotaur; +Dough = Baker; +Dust = Allergy; +Electricity = Electrician; +Energy = Wizard; +Excalibur = Monarch; +Field = Farmer; +Fire = Fireman; +Firetruck = Fireman; +Fish = Mermaid; +Fishing Rod = Angler; +Flour = Baker; +Flute = Music; +Garden = Gardener; +Glasses = Nerd; +Goat = Faun; +Grim Reaper = Corpse; +Gun = Corpse; +Hard Roe = Caviar; +Hay = Scarecrow; +Horse = Centaur; +Hospital = Doctor; +House = Family; +Human = Love; +Letter = Mailman; +Light Bulb = Idea; +Lightsaber = Jedi; +Lion = Sphinx; +Meat = Butcher; +Medusa = Statue; +Metal = Tool; +Moon = Astronaut +Oxygen = Carbon Dioxide; +Pitchfork = Farmer; +Plant = Farmer; +Rain = Cold + Sickness; +Robot = Cyborg; +Rocket = Astronaut; +Scythe = Grim Reaper; +Seaplane = Pilot; +Shuriken = Ninja; +Sickness = Sickness; +Snake = Medusa; +Snow = Snowball + Snowman; +Sound = Music; +Space = Astronaut; +Space Station = Astronaut; +Swim Goggles = Swimmer; +Sword = Warrior; +Tool = Engineer; +Vampire = Vampire; +Wave = Surfer; +Werewolf = Werewolf; +Wild Animal = Dog + Livestock; +Wine = Drunk; +Wire = Electrician; +Wolf = Werewolf; +Wood = House; +Wool = Sweater; +Zombie = Zombie.